Monumental, historical and a patriotic time for us Brits – and it is a sad, sad thing that we must say Goodbye to the Olympics - for now at least. 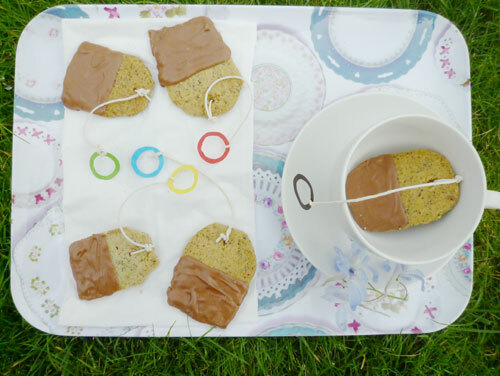 In honour of this awesome occasion, we decided to make tea bag biscuits – Olympic ring style! Keeping it patriotic, we thought that tea and shortbread – two very British things – would be most fitting! With a spin on traditional shortbread we used Earl Grey tea leaves in them as well. Inspired by French blogger http://bit.ly/MS8fLql, here is our own adapted version of Tea Boogies – great for any occasion! - Dunk into your celebratory tea! Yum yum. so lovely! I want to try these. I'll probably make them soon, or I'll draw them at least. Anto - have just looked at your lovely lovely blog! Please do post your drawings (or biscuits)!